Clifton, NJ – May 11, 2016 –Steve Venier knows a thing or two about sick animals. As a regional manager for a large specialty and emergency animal hospital system, he has seen hundreds of ill and injured patients over the years. So when his own pet, a 10-year-old dog named Tina, was suddenly ailing, he quickly brought her in for a comprehensive exam. Tina was diagnosed with a trigeminal nerve sheath tumor – doubly dangerous because of its proximity to the brainstem and confinement within the skull. Fortunately, new technologies have been developed to improve the efficacy of treating a wider range of tumors, especially in delicate locations like the brain. 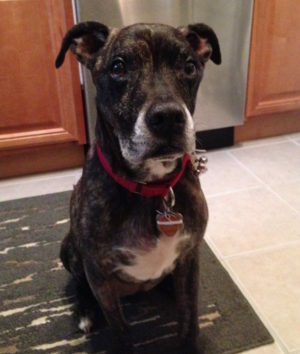 Veterinary oncologist Joshua Lachowicz, DVM, DACVIM (Oncology) referred Tina to what was then known as the Veterinary MRI and Radiotherapy Center of New Jersey. The progressive cancer care and imaging center was among the first to deliver an emerging form of advanced radiation therapy called stereotactic radiosurgery (SRS). Now known as the Veterinary Radiosurgery and Imaging Center (VRIC), the leading-edge practice is part of a national network of cancer care centers operated by PetCure Oncology. Tina had three SRS treatments delivered on consecutive days without any side effects. One year later, a follow-up MRI showed the tumor had been reduced by two-thirds of its original size. Tina was on the path to being cancer-free – until she had a seizure just after her treatment anniversary. Another MRI revealed a second tumor – completely unrelated to the first – in the frontal lobe of her brain. This time it was a glioma, a brain tumor that is very responsive to radiation therapy. Steve made another appointment that ultimately led to another three-fraction treatment course of SRS. Six months later, a follow-up MRI showed no trace of the tumor. With the exception of general aging, Tina’s personality remained the same throughout the two years of treatment. In recognition of May’s Brain Tumor Awareness Month, PetCure Oncology appreciates that brain tumors occur in both humans and pets. Seizures are the most common indication of brain tumors in dogs. Other symptoms may include unusual behavior or temperament, vision problems, movement in circles, uncoordinated movement, unsteady gait, lack of appetite, inappropriate urination, and/or lethargy. While brain tumors in cats are less common, they may display the same symptoms as dogs along with head-pressing and unusual meowing. Seek immediate care for a pet that shows indications of a brain tumor. PetCure Oncology’s national network of veterinary cancer care centers specializing in SRS includes Arizona Veterinary Oncology in Gilbert, Arizona, Care Center in Cincinnati, Ohio, Veterinary Radiosurgery and Imaging Center in Clifton, New Jersey, and Lakeshore Veterinary Specialists in Milwaukee, Wisconsin. Additional centers across the country are in various stages of development. Visit PetCureOncology.com for more information.